the time i am using is off a video camera where a couple were seen prior to the police being notified of sergei and daughter slumped on the bench...the time could be off, but there is open speculation on just when they were poisoned.. was it at the zizzi restaurant, or? or on the bench? the day chart for sergei skripal is off the time given on the wikipedia link at the top. if you put the 2 charts on a biwheel, a few things become apparent.. keep in mind the time for sergei is noon, so the moon can be out... as it turns out the moon is in the proximity of his natal neptune... there is a sun/neptune conjunction on the date of this event which happens to land right on sergeis north node in pisces.. transiting mars is exactly opposite sergeis natal mars.. the transiting moon is applying in a square to pluto..
meanwhile, the drums of war continue to get louder... in the absence of proof - same deal in the ramp up to the war in iraq - there is all sorts of banging of war drums, but no tangible proof... it always amazes me to see how keen western culture is to arrive at a guilty verdict in the absence of proof and worse - want to make war on it..
not sure what you mean by 'north node conj moon' in the inauguration chart starts to work... do you live in russia? 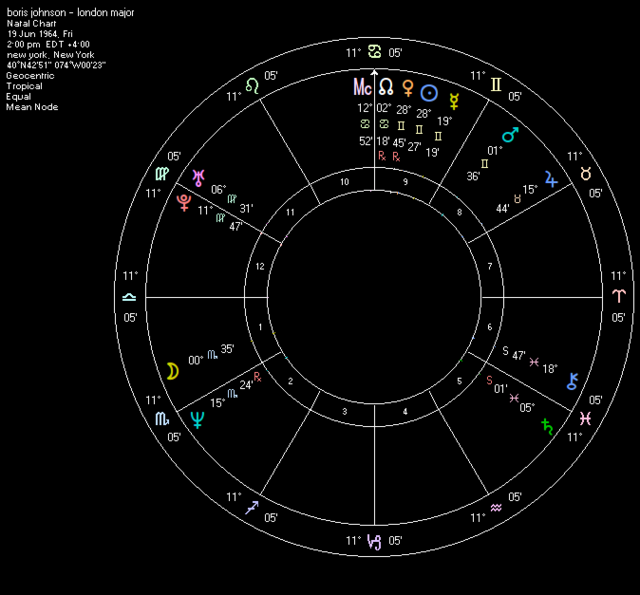 if so, what are the local astrologers using for a chart for putin? thanks..
i am sharing this as it would seem the time of the event where some substance was placed in the car, would have been much earlier, if that is how this unfolded... 1255 would put pluto exactly on the descendant - 21 cancer rising..
Skirpal angry with loss of emotional control. Roughly 30 minutes from parking car to first evidence of toxic poisoning. Suggests toxic agent was placed in car and both Skirpals exposed. Toxic agent likely a powder from of organophosphate weed killer." The Police in the UK feel that the Nerve Agent was on the front door of the Russians House. So you'd need to adjust the timing considerably. What changes does that throw up ? The event chart may well have to be revised, since the alleged murder took place at the man's front door of his home. That said Skripal's transits to his natal chart are smoking gun, as they say. Transiting Neptune was conjunct his north node. for openers. That is quite the hit, I'd say, as Neptune rules poisons. Without his actual time of birth, predicting an outcome is difficult. But he has two very difficult progressions; SP Saturn is squaring his natal Sun, while SA Neptune (poisons and drugs) opposes natal Mars. 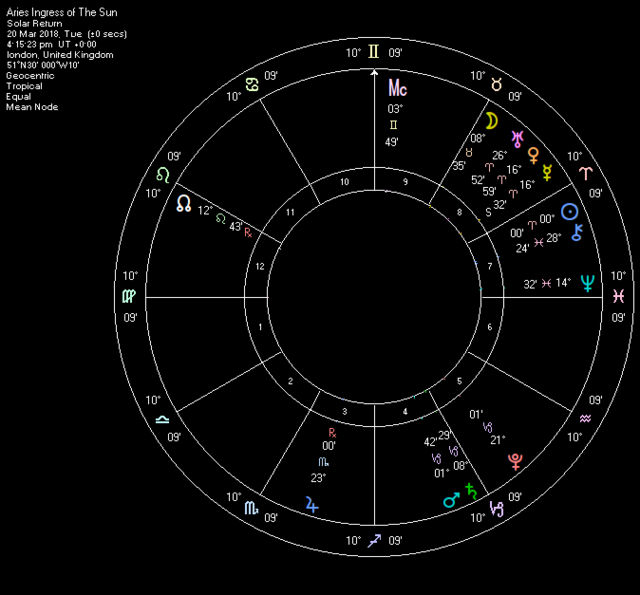 Also, take a look at the multiple Uranus Saturn transits. Transiting Saturn in Capricorn was opposite natal Uranus, at the time of the incident, while transiting Uranus in Aries was in the 8th house, inconjunct (150 degrees) his own natal Saturn in Virgo. The 5th house rules his children, so Saturn as ruler, would indicate how his daughter got poisoned, as well. But that (his daughter's poisoning) may have been accidental. The "plan" was likely to kill him, and not his daughter. But, media reports say that the daughter is recovering well from the incident, so she may be a possible witness at any upcoming trial, especiallly if she can "id" the perp. (which is possible, if she was also at home at the time of incident). The event chart shows that there were two suspects, assigned to do the dirty deed on Skripal. One was a "spy" (Neptune in Pisces) possibly a female. The other was a government employee, someone important (Sun in Pisces, angular), perhaps a male, but also, a spy? The Sun's recent conjunction with Neptune suggests that the "assignment" was hastily arranged to one of them, perhaps at the last moment. But the event was planned, overall, at great length. We do not know if the British government will ever capture and or convict the person(s) responsible for this latest attack. However, the last aspect the Moon makes before it leaves the sign is an opposition with Uranus. That would suggest an unusual and or surprising outcome to this matter. However, since I am not a clairvoyant, I cannot say for sure what that outcome is. We might be getting somewhere with this. With Neptune, sometimes things are not always as they seem. Astrologer Robert Hand, in his legendary book, Planets in Transit, said it best about the transit of Neptune, particularly to the lights (natal Sun and Moon) and also, to the natal first house. "You can never be sure about the actual effects of Neptune's transit, until after the transit is actually over. It may take several years after the transit is over, to process it, mentally, and to figure out what actually happened." Hand then cited the transit of Neptune going through his own stellium of natal planets, (Sun, Mercury, and Venus, in Sagittarius), back in the 1970's and how those transits brought confusion as to how things really were. If you are Sagittarius prominent, then you understand what Robert Hand meant, if you lived during the 1970's. This is a very good way to approach Neptune, in general, for all of its transits, whether for natal work or mundane work. Regarding the alleged coverup by the British government, since Mercury is currently retrograde, we need to be patient and wait for all of the facts to arrive? One of the darker sides about the internet is the tendency for people to make snap conclusions about the planets and even, about people, in the timeframe that it takes to get your McDonald's hamburger, from the grill to your car ? We need to avoid the temptation of hastily made "Mcdonald's hamburger astrology," and - McDonald's hamburger relationships. - We should be careful about the real facts and details at this time, especially when investigating complex, international issues like Sergei Skripal. Robert Hand's transit book sounds like a great read, and your point about r.Mercury is very relevant. I must admit I've got a bit lost by this. Why are they whipping up all this hysteria against Russia ? What is going on ? But many of his family member had died recently. That's more of a Mafia trick I'd say. There is more to this, as some of the more Right Wing thinkers seem to think Soviet Tanks will be coming over the hill any moment soon, the way they are trying to keep it burning. Thanks for the link to Craig Murray. Of course it took a Scot at Portland Down to stand up to the pressure from The Spin Factory. It is all that granite we sprinkle on our porridge. Here's an interesting interview with Tony Gosling, ex-bbc Salisbury reporter. 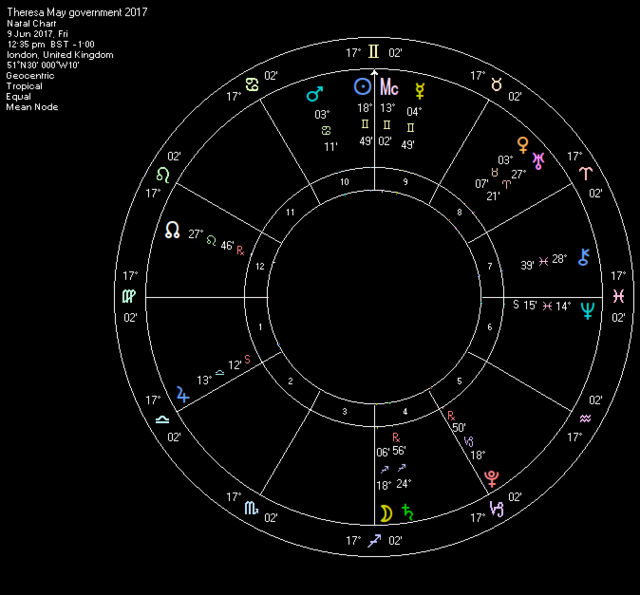 unfortunately the time for theresa mays government being sworn in has neptune on the descendant and prominent here as well.. in fact, there is 7 degrees difference between the ascendant in this chart and the one for the 2018 aries ingress with 10 virgo ascendant, neptune at 14 pisces in the descendant..
in looking at the chart below, while mercury the ruler of the ascendant and midheaven/sun is strong by sign and house, both lights are embedded within the neptune saturn square - which ordinarily might be ignored with it's 10 degree range, however the midpoint at approx 19 is very close to where the lights are at 18... a shadow hangs over this government, and perhaps it is borne out from the cloud of uncertainty over what brexit brings in all of this..
below is the uk aries ingress chart for 2018..
moon of alabama article on this from today. craig murray article from today.. Regarding Boris Johnson, I agree that with t. Uranus in Taurus opposite his career marker (Moon in Scorpio, in first house), a change in his career status is imminent and not for the good, either ! When Uranus travels your natal 7th house, your closest advisors and partners will turn on you, and it typically means being scr&wed over, by others in your inner circle. What is interesting is when people of Scorpio types take over the foreign affairs portfolio, there is monkey business at every opportunity. Hillary Clinton (double Scorpion, some say, never confirmed though) and her Benghazi event, and hiding of personal emails, Boris Johnson and his history of lying and conning. Then, there is Scorpion rising Vladimir Putin, who has been accused of intimidation and threats against fellow politicians, journalists, and foes. Some say he outright ordered the killings of multiple Russian people. However, when it comes to political leadership, more Scorpios rise to the top of the political heap than any other sign, according to this article in the Daily Mail, three years ago. A survey of more than 190 political world leaders confirms a startling pattern. As for Theresa May, we don't have her time of birth, but with natal Sun in Libra and Moon in Virgo, her natal chart is troubled, as well, as t. Saturn currently squares her Sun, while t. Neptune conjoins natal Mars. Two nasty, debiltating transits, if you ask me. (Charles Manson had this aspect, natally). Mars is important in her natal chart, as it is the "handle" of the bucket type formation and major life events are often triggered when Mars is transited. Neptune is not always deception, but it can mean confusion, self-denial, or even martyrdom. That said, there is nothing, astrological, to suggest that the May government will leave us, anytime soon, as transiting Uranus does trine her natal Moon at 1 Virgo, in the next year. That tells me that Theresa May could well re-invent herself, politically, and thus, stay in power longer that originally thought. Regarding Russians being ganged up on by others, well, Russia is no innocent damsel tied to the railway tracks. There are numerous, numerous, deliberate provocations made by the Russians, in recent years, from flying their jets within 15 feet of American and British jets, flying overhead American battleships without good reason, trespassing on NATO airspace, the inventors of performance enhancing drugs for their Olympic athletes (along with the Burgarians) and the covert spying on of everyone on the planet, including Canadians, Americans, and every western country. Then, there is the hacking of computers. People are tired of this manipulation ? Russia is a persistent violator of many human rights abuses, according to Amnesty International. They are not innocent by any means ! This thread went into a tangent about the astrological significator for Communism. I think its an interesting question but I cannot see any logical connection to the current thread. I have therefore split that topic into a new discussion on the forum entitled 'The Astrology of Communism'.